The incident took place at a rally celebrating the 54th anniversary of Fatah, the largest party in the coalition governing the Palestinian Authority. 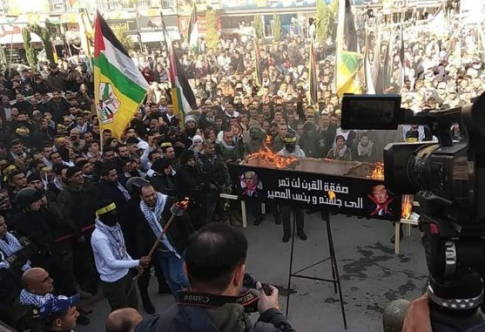 During the event, a coffin featuring the faces of Trump and Israeli Prime Minister Benjamin Netanyahu was set on fire, according to a Palestinian Media Watch report. A slogan on the side warned that "The deal of the century will not pass, to **** with it and good riddance," in apparent reference to Trump calling a successful peace proposal between the various parties the "deal of the century." In addition to the coffin fire, the Palestinian event included speeches from political leaders. Mahmoud al-Aloul, deputy chairman of Fatah, addressed the audience, praising Fatah's record of violence as a means to "liberation." Al-Aloul also praised Palestinian terror activities responsible for scores of civilian deaths, according to statements released in an official PA daily. He "praised the terror attacks and the Palestinian waves of violence and terror against Israel (the intifadas) as ‘accomplishments' of Fatah’s ‘self-sacrificing fighters,' and ‘battles of honor,' which have ‘brought glory to the nation," PMW's Itamar Marcus and Nan Jacques Zilberdik reported.